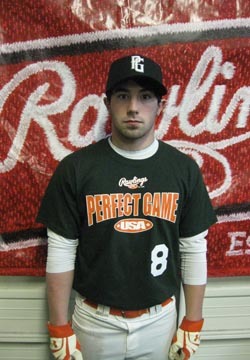 Corey Patrick is a 2010 OF/RHP/IF with a 5'9'', 175 lb. frame from Yorktown, VA who attends Tabb HS. Medium to small frame, some present strength. Tall no stride stance, throws hips to ball but rotational upper half, stays inside ball well, solid opposite field contact, keeps hands short to ball, good hitter's hands, would benefit from spreading out a bit. Moves to ball well in OF, clean release, accurate throws, some developing arm strength.